The Partido Agrario Nacional, PAN (English: National Agrarian Party) was a party established by Erasmo Valencia and was later joined by Juan de la Cruz Varela Aldana, promoting land ownership for small peasants as well as free choice of crops to grow in the lands they worked on, against landlords who possessed the lands but did not grant land ownership nor free election of crops. Its area of influence was mainly located (http://www.scielo.org.co/img/revistas/tara/n4/n4a13f2.gif) in the subregion known as Sumapaz (in Cundinamarca and it included also the bordering eastern Municipalities of the Department of Tolima, mainly Icononzo, Cunday and Andalucía (today known as Villarrica). It was a region that flourished in the early 1920s thanks to coffee growing. Meanwhile, members of this political party, Partido Agrario Nacional, who did not want armed struggle, either joined the Unión Nacional de Izquierda Revolucionaria, UNIR (English: National Union of the Revolutionary Left, UNITE) (1933-1935), which were dissidents of the Liberal party which would eventually joined back and adhere to the Liberal party again) and later onwards others joined the	MRL (which eventually joined the mainstream Liberal Party as well) while some others joined the Communist Party (which was prohibited for some time). In fact, Juan de la Cruz Varela Aldana, thanks to a government amnesty in 1957, went back to politics and joined the MRL himself. The Partido Agrario Nacional lost influence due to both, the killing of some of its members, as well as the armed struggle that ensued as consequence of political violence between the two main traditional parties becoming extinct in the early 1930s. http://pacifista.co/wp-content/uploads/2016/01/IMG_9182.jpg (source: https://pacifista.co/juan-de-la-cruz-varela-la-primera-voz-campesina-del-archivo-general-de-la-nacion/). The logo is a peasant of the region, holding an axe and wearing a machete, over a crop, with the inscription on top "TIERRA, LIBERTAD Y JUSTICIA" (English: Land, Liberty and Justice) and below "PARA LOS CAMPESINOS DE COLOMBIA" (English: For Colombian Peasants), all in golden capital letters. Today, this very same logo is used by the "Sindicato de Trabajadores Agrícolas de Sumapaz" (English: Trade Union of Agricultural Workers of Sumapaz) (established in 1957) as seen here: https://www.prensarural.org/spip/epc_3c/imagenes/logo_sintrapaz.jpg. "Mothertongue Name: Coordinadora Guerrillera Simón Bolívar (CGSB). Base of Operation: Colombia. Founding Philosophy: In the 1980s, several leftist terrorist organizations in Colombia created an umbrella organization, from which to coordinate negotiations with the Colombian government and to coordinate certain terrorist activities. The National Guerrilla Coordinating Board (CNG), formed in 1985, was the forerunner to a broader coordinating board. In 1987, CNG was reconstituted as the Simon Bolivar Coordinating Board (CGSB). CGSB was created as a unified front for the terrorist-organization members. While CGSB engaged the government in negotiations, the terrorist members simultaneously held onto their rebel-controlled areas and remained willing, at varying levels, to commit terrorist attacks. The Simon Bolivar Coordinating Board was comprised of Revolutionary Armed Forces of Colombia (FARC), April 19 Movement (M-19), National Liberation Army (ELN), Popular Liberation Army (EPL), Workers' Revolutionary Party (PRT) and the Quintin Lame Command. CGSB participated in a series of government talks in the early 1990s. The talks were jeopardized several times by terrorist attacks of the FARC and ELN. Despite the continuing aggression of the two largest terrorist groups, CGSB did achieve limited success. Resulting from government negotiations, M-19 put down its arms in 1990. EPL's main body followed step, ceasing its operations in 1991. However, Colombia's largest leftist terrorist organizations, FARC and ELN, did not reach a settlement with the government and continue terrorist operations to this day. In fact, while some groups seriously negotiated for an end to hostilities, other elements of the CGSB continued to perpetrate terrorist attacks, claiming attacks both under the umbrella of CGSB and as individual terrorist groups. Current Goals: The Simon Bolivar Coordinating Board (CGSB) disbanded in the early 1990s. While certain CGSB factions ceased terrorist operations in the early 1990s, the FARC and ELN remain significant terrorist organizations". The flag of Ejercito de Liberacion Nacional is at www.eln-voces.com. The flag and emblem of ELN is explained by the organization in this site. Mothertongue Name: Ejercito de Liberacion Nacional (ELN). Base of Operation: Colombia. Founding Philosophy: The ELN is a Cuban Revolution-inspired group, heavily influenced by the early actions and theories of Fidel Castro and Che Guevara. The ELN emerged following the overthrow of the Cuban government by Guevara and Castro in 1959. The National Liberation Army was founded by two distinct groups. The first group comprised of urban, left-wing intellectuals with strong ties to rural farmers. They co-founded the group with a radicalized group of oil sector unionists from Barrancabermeja's oil industry. Radical members of the Catholic clergy joined the group in late 1965. This was the first time that Christians and Marxists had joined together in a Colombian revolutionary movement. The ELN's unique founding philosophy strongly emphasized socialism, mixing Castro-ism with the liberation theology of the Catholic Church. More concretely, the ELN's self-appointed role was to represent the rural poor and decrease the foreign presence in Colombia. The ELN's goal was to take power from the Colombian government and replace it with a more egalitarian "popular democracy" that would represent all Colombians equally under the law. The ELN strongly opposed foreign investment, in part due to its location in an oil-rich area and its connections to trade unionists in the energy sector. 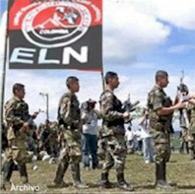 The Colombian Department of Administrative Security estimates that in 1998 alone, the ELN obtained U.S. $84 million from ransoms and U.S.$255 million from extortion. Employees of oil companies constitute a large percentage of the ELN's targets. The kidnapping and extortion of oil company employees is ELN's primary source of income. This is a natural legacy of ELN's formation in an area rich with oil wells and oil companies. A third, more recent source of income is the collection of a "property" tax from coca and poppy cultivators. It is not known whether the collection of property taxes is a centralized or decentralized activity. Current Goals: Throughout its history, the National Liberation Army steadily gravitated towards violence and armed struggle as a means to attain a socialist Colombia. At the ELN's 1996 national conference, the group decided to decrease emphasis on creating a purely socialist Colombia. Instead, the ELN has returned to its founding objective: popular democracy for all Colombians, propagated at the local level. The ELN has not given up the use of violence in its efforts. There is another version of the armed group called ELN at Army's official website at news article dated June 2005. Motto in white ring is "NI UN PASO ATRAS - LIBERACION O MUERTE" (Not one step back - Liberation or death). There is another curved inscription above the ring that is unreadable. During a recent video one can see a white flag with the logo (on the left) of the ELN. This is a variant of the already reported flag. The National Liberation Army- Camilista Union, (ELN-UC), insurgent group in Colombia, uses also Black & Red flag and generally, with the abbreviations of the group on the division of the stripes in yellow letters. Given the bonds of ELN with Cuba, it's possible that the ELN's flag is based fundamentally on the one of "July 26' Movement". The called "Pérez the Priest", famous Catholic father and leader of the Ejército Nacional de Colombia, born in Aragon, deceased in March 1998. 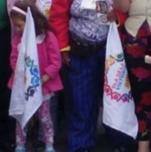 In an archival image we can see the Curate Perez with a flag that seems to be from a mass organization supported by the guerrillas: The Unión Camilista. Probably the name is derived from the first leader of the guerrilla, another catholic father, Camilo Torres. The ELN has had over the past years several breakaway factions. One of the most important ones was the Corriente de Renovación Socialista (CRS, Socialist Renovation Movement). It emerged during the peace talks between the leftist guerrillas and the Colombian government in the early 1990's. It appeared officially in 1991, and it acted mainly in the Departments of Sucre, Córdoba and Bolívar. It also signed a peace agreement on April 9, 1994. I found a PDF document with important information on the CRS. In it you can see pictures of armed fighters wearing the new version of the demobilized CRS flag and logo (on pages 129, 133 and 134 of the document). It has three white letters CRS, on the tricolour flag resembling the Colombian flag. The CRS was at one point part of the ELN. The ELN-uc was the result of the merger of these two groups as this declaration (http://www.cedema.org/ver.php?id=4519) shows, issued on June 23, 1987. Now, before the CRS had that name, it was called MIR-PL (Movimiento de Integración Revolucionaria - Patria Libre, Revolutionary Integration Movement - Free Fatherland). (source: page 14 of this PDF document: https://dialnet.unirioja.es/descarga/articulo/4716503.pdf , titled "EJÉRCITO DE LIBERACIÓN NACIONAL COLOMBIANO: DESDE LA RENOVACIÓN POLÍTICA A LA CORRIENTE DE RENOVACIÓN SOCIALISTA, 1978-1994" (COLOMBIAN NATIONAL LIBERATION ARMY: FROM THE POLITICAL RENOVATION UNTIL THE SOCIALIST RENOVATION MOVEMENT, 1978-1994), an article published by Jaime Reyes in "Revista Divergencia" ISSN: 0719-2398 Issue No. / Year 2 / January-July of 2013 / pages 71-88). The logo of MIR-PL is seen here: http://www.cedema.org/uploads/patria_libre_web.jpg (source: http://www.cedema.org/ver.php?id=4519). MIR-PL emerged from the schism within the PCC-ML in the 1970s. This divergence among its members led to the creation of other tendencies, of these, the most important ones being the Tendencia ML (Marxist Leninist Tendency) which gathered some of the splitting members (i.e. Liga ML (ML League), PCM-LP (Partido Comunista Marxista - Linea Proletaria, Communist Marxist Party - Proletarian Linea) and an Eln breakaway faction called Movimiento de Unidad Revolucionaria (MUR, Revolutionary Unit Movement). This led to the unification under one single name: MUR-ML (Movimiento de Unidad Revolucionaria - Marxista Leninista) (Revolutionary Unit Movement - Marxist Leninist), which in turn was merged with another group called MIR (Movimiento de Izquierda Revolucionaria, Revolutionary Left Movement), giving birth to the MIR-PL in 1983. After the MIR-PL started peace talks with the government in Caracas (Venezuela) but were forced to move to Tlaxcala (Mexico) because of a coup d'état by Hugo Chavez in 1992 (who would eventually take power in 1999 following the 1998 elections. The MIR-PL advocated for peace, and other factions within the ELN did not agree, and that's when the MIR-PL is forced out of the UC-ELN, adopting a new name, CRS and starting independent negotiations with the government (apart from the	CGSB) which was the acting party representing all united guerrillas in peace talks with the government at the time) which eventually led to their demobilization. The MIR-PL logo is seen here: http://www.cedema.org/uploads/patria_libre_web.jpg (source: http://www.cedema.org/ver.php?id=4519). It is the outline of the country and inside the name of the group "PATRIA LIBRE" in capitals. Congreso Nacional (National Congress) held on June 6, 2000, they decided to change their name to PSD (Partido del Socialismo Democrático, Democratic Socialism Party) and during the I Congreso Nacional (National Congress) of the new party held in August 24 and 25, 2000 they decide to incorporate other organizations as follows: "Alternativa Socialista y Democrática del Tolima para Colombia" (Socialist and Democratic Alternative of Tolima for Colombia), la "Asociación de Ciudadanas y Ciudadanos por la Democracia" (Association of Citizens for Democracy), el "M-19 del Valle del Cauca (Yumbo)" (M-19 faction of the city of Yumbo and the Department of Valle), Espacio Democrático (Democratic Space), Compatriando (Unifatherland), among others. 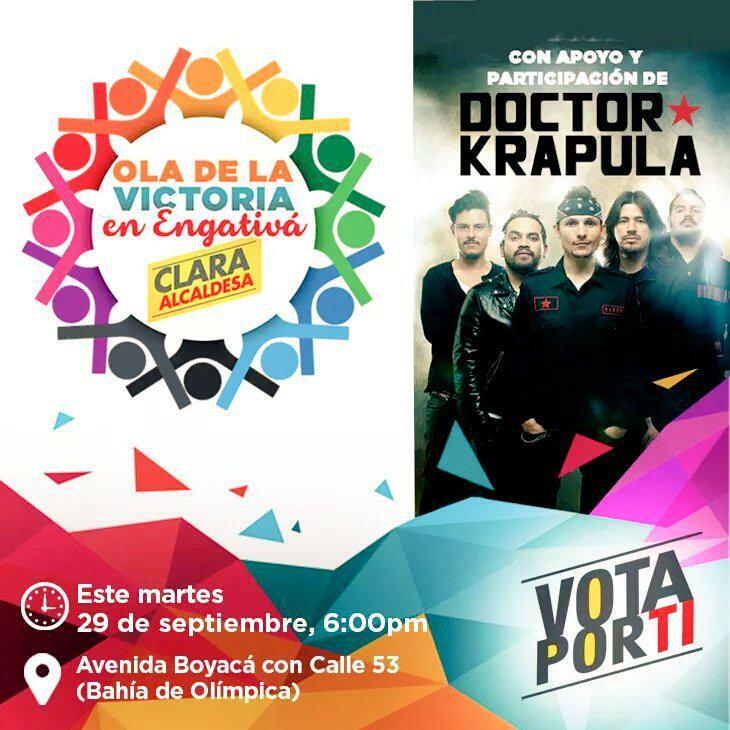 Clara López, currently running for Mayor of the city of Bogotá in the upcoming October 25 local elections by the Polo party, portrays a campaign flag featuring the logo with an inscription that cites "Ola de la Victoria" (Victory wave) and the name of the Localidad (Locality, an administrative subdivision of the city). In this case for example, the flag is seen portraying the name of Localidad de Ciudad Bolívar (official website), during a political rally in the San Francisco neighborhood of this Localidad. Image cropped from news report by CM& TV news yesterday. The complete image is seen here.